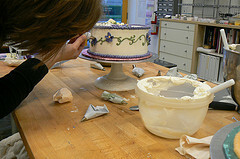 My student is decorating a lovely cake with Italian meringue buttercream. For the Vanilla Chiffon Cake you will need three 9 inch cake pans prepared by spraying only the bottom of the cake pans and lining them with parchment rounds. Place the whites in a bowl of a heavy duty 5 quart mixer with a whip attachment. Start whipping the egg whites and when they reach the soft peak stage add 9 ounces of the granulated sugar in a thin stream. Continue to whip until the whites reach the stiff peak stage is reached. Do not over whip. In the bowl of a heavy duty 5 quart mixer with a whip attachment, place the yolks, water, oil and vanilla and blend together well. Sift the flour, baking powder, 5 ounces of the granulated sugar and the salt together and then add the dry ingredients all at one time to the yolk mixture and begin to blend. Scrape down the bowl and blend until there are no lumps of flour..this should only take about a minute. What I love about this recipe is that the Chiffon Cake is very forgiving. You can increase the speed of the mixer to make sure it is well mixed. Fold in the egg whites and make sure there are no bits of whites unincorporated. The folding process works best when you cut into the whites and lift the yolks mixture up and over them. When you make large batches of vanilla chiffon cake..double this recipe for instance, you might want to use a plastic bowl scraper to reach down into the batter because otherwise you might not get the batter well mixed. Divide the batter between the cake pans at 1 pound 2 ounces per cake pan. Bake at 350 degrees F for about 25 minutes or until golden. Cool in the cake pans at least 15 minutes before depanning and make sure the cakes are completely cool before chilling them in the refrigerator. Whip the heavy cream and set aside in the refrigerator. Puree the clean strawberries in a food processor. Pour puree into a sauce pan and add the granulated sugar. Allow to sit for a few minutes to start to draw moisture from the puree and cook on medium high heat until the mixture begins to boil and the sugar completely dissolves. Place the mixture in a large shallow bowl and allow to cool to a temperature of about 110 degrees F.
Dissolve the powdered gelatin in the cold water and allow to bloom. Blooming means that all the gelatin will absorb the water. Microwave the gelatin for about 14 seconds or until it is dissolved and is a temperature of about 110 degrees F.
Pour the gelatin into the strawberry mixture and stir well. Refrigerate until the mixture has cooled to a tempterature of about 87 degrees F and then fold in the whipped cream. Clean the tops of the cakes by removing that thin bake layer. This can be done with a gloved hand or a serrated knife. The simple syrup can be flavored with pure vanilla extract or Madagascar vanilla bean paste..but it should be a ratio of 2:1 or 2 cups of water to 1 cup of granulated sugar, boiled for 10 minutes and cooled. Brush the simple syrup as opposed to using squeeze bottles for a more even application of the syrup. Remember that the chiffon cakes are designed to absorb syrups so don’t be afraid to apply the syrup generously. 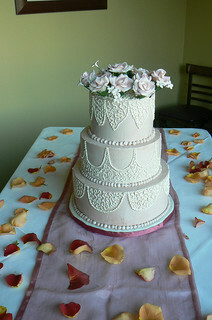 Build your cake in the usual manner by lining a 9″ cake pan with plastic wrap. Add a layer of cake, brush with simple syrup, pipe a dam of Italian meringue buttercream around the cake to hold the filling in, fill with strawberry mousse and put another layer of cake on top of that..repeat! The top layer of cake should be placed on top of the second layer of mousse upside down so that the bottom is up. 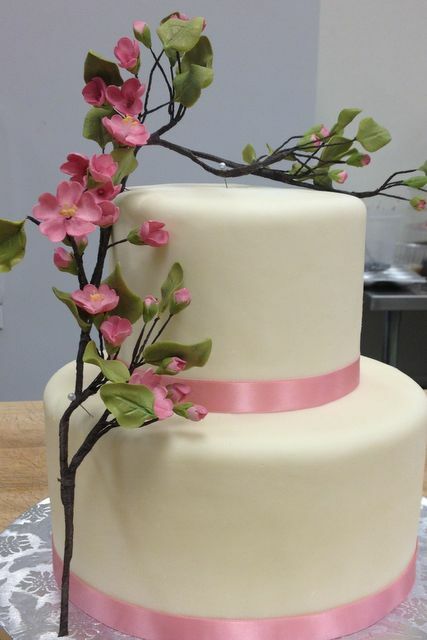 remember you want to have flat tops and straight sides ..especially if you are going to stack the cake for a wedding cake. Ice the cake with Italian meringue buttercream. These cakes can easily be covered with white chocolate fondant as long as you chill the buttercream well. 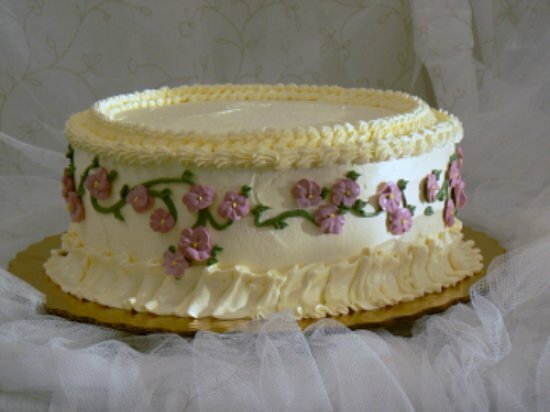 For stacking delicate cakes, make sure your dowels are about 1/16th inch above the surface of the cake so that the cakes on their cake boards are sitting on the dowels and not on the cakes. It is advisable to deliver delicate cakes in separate cake boxes and not necessarily stacked and delivered. This is just good advice especially for those of you who might have to deliver cakes up steep hills. Italian meringue buttercream is what I ice and decorate all my cakes with. It is a sturdy buttercream because a hot sugar syrup is poured into stabalized egg whites that are whipped to a stiff peak. The hot sugar syrup is taken to a temperature of 245 degrees F and for piping purposes, I will take the temperature to about 250 degrees F. The egg whites are stabalized with a small portion of the granulated sugar in the raw form. When the syrup is added to the egg whites the syrup will go towards the raw sugar and temper the syrup so that the egg whites do not turn into an omelet or souffle. Place 3/4 cup granulated sugar into a heavy bottom saucepan with 1/4 cup cold water which is used to moisten all the granulated sugar. Wash any granules of sugar on the side of the saucepan before you begin to boil it. Boil the sugar in the water until it reaches a temperature of 240 degrees F. I take the sugar to 250 degrees F if I am going to use it for piping. Place the egg whites in the bowl of a heavy duty mixer and begin to whip the whites as you begin to heat and boil the sugar in the saucepan. Timing is somewhat important. You don’t want the sugar to be too hot before the egg whites have whipped completely. When the whites are at a soft peak, add the 1/4 cup granulated sugar and whip the egg whites to a stiff peak. The buttercream is not going to be perfectly white because butter is not white. The pure vanilla extract is not white either but if you add a small amount of confectioners sugar the buttercream will become lighter in color. 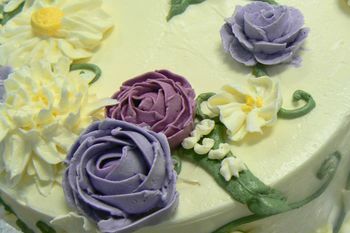 Confectioners sugar also allows gel colors to become more vivid. If you color Italian meringue buttercream without confectioners sugar it can appear grainy and muted..adding a little confectioners sugar and voila, the colors become quite vivid.